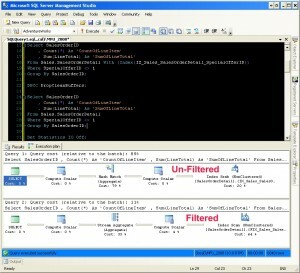 SQL Server would not allow me to execute the stored procedure using the filtered index hint. If I removed the hint, it executed, but it used a different, non-covering and far more expensive index. For those of you not familiar with this issue, allow me to illustrate the problem. If you look at the execution plan for this query, you’ll notice that the Optimizer is using the filtered index. Perfect! Now let’s parameterize it. So what can we do? Well, dynamic SQL may be able to help us out in this case. Let’s give it a go. First, let’s try parameterized dynamic SQL. Voila! We have a seek on our filtered index. Why? Because the statement resolves to be identical to our first query, where we hard-coded the date value in the WHERE clause. Now, I want to stress this fact: you should always, ALWAYS use parameterized dynamic SQL whenever possible. Not only is it safer, but it’s also faster, because it can reuse cached plans. But sometimes you just cannot accomplish the same tasks with it. This is one of those times. If you do end up needing to use unparameterized dynamic SQL as a work-around, please make sure you’re validating your input, especially if you’re interfacing with any sort of external source. There’s an even easier work-around for this problem that Dave (http://www.crappycoding.com) shared with me: recompile. If we look at the execution plans for the 2 queries above, we see that the first query seeks on the filtered index, and the second query scans on the clustered index. This is because the second query cannot be satisfied with the filtered index because we initially limited our index to dates greater than or equal to 1/27/2010. For those of you who are using partitioning, or who are considering using partitioning, allow me to share some tips with you. ALTER TABLE SWITCH statement failed. Check constraints or partition function of source table ‘myStagingTable’ allows values that are not allowed by check constraints or partition function on target table ‘myDestinationTable’. You could also use an edition check instead of a server name check, if you prefer. The post-snapshot script basically looked the same, except you create partitioned indexes instead. A couple of things to note. In all of our proof-of-concept testing, we found that compression significantly reduced query execution time, reads (IO), and storage. However, CPU was also increased significantly. The results were more dramatic, both good and bad, with page compression versus row compression. Still, for our older partitions, which aren’t queried regularly, it made sense to turn on page compression. The newer partitions receive row compression, and the newest partitions, which are still queried very regularly by routine processes, were left completely uncompressed. This seems to strike a nice balance in our environment, but of course, results will vary depending on how you use your data. Something to be aware of is that compressing your clustered index does *not* compress your non-clustered indexes; those are separate operations. Lastly, for those who are curious, it took us about 1 minute to apply row compression and about 7 minutes to apply page compression to partitions averaging 30 million rows. Looking for more information on table partitioning? Check out my overview of partitioning, my example code, and my article on indexing on partitioned tables. If you’ve been following my blog for a little while, you’ll know that I’m a fan of SQL Server internals. There’s a lot that can be learned or better understood by rolling up your sleeves and getting into the nitty-gritty of data pages (i.e. see my post on Overhead in Non-Unique Clustered Indexes). So imagine how happy I was when my co-worker Jeff shared an undocumented function with me today that retrieves the file number, page number, and slot number of a single record. Very cool! Well, at least to me. So now let’s see how you can use it. If you look at the sp_helptext for sys.fn_physLocCracker, %%physloc%% is apparently a virtual column that contains information on where the record is stored. In fact, you can even append %%physloc%% to your column list if you want to see how the information is stored. But for our purposes, we now have a file number, page number, and slot number. What do we do with it? Neat, huh? So why would you use it to look up the data page and file number when you can just pass the table name and index name to my proc and retrieve data pages? Well, my investigation proc will retrieve data pages for any index type — the fn_physLocCracker function will only retrieve data for the clustered index — but it will not retrieve the data page for a specific record. So just something to be aware of. Filtered indexes are probably my favorite feature in 2008. That’s saying a lot, since there are so many great new features to choose from. In this post, I want to explore a little about how filtered indexes work, how they can be applied, and some of the “gotchas” to be aware of. For our purposes, we’re going to be working with the Sales.SalesOrderDetail table in the AdventureWorks database. Let’s look at a specific example. Suppose we have a query that regularly searches on the [SpecialOfferID] column. So we’re now performing a non-clustered index seek instead of a clustered index scan. Already this results in some pretty significant performance improvements. To see this, we’re going to use the INDEX query hint to force an index scan. We’re also going to use the DBCC command DROPCLEANBUFFERS, which will allow us to clear the buffer cache and better examine what’s happening with our IO. If you scroll over, you’ll see that the clustered index consumes the most pages, naturally. The non-filtered NC index consumes less pages than the clustered index because it’s narrower; however, it still consumes more pages than the filtered index because it’s storing every data row. The filtered index, with only 5433 rows stored, is by far our smallest index, consuming 96% less space than our non-filtered NC index. As expected, we get the best results with our filtered index scan. You’ll notice that I did *not* create the index on the [SpecialOfferID] column like I did in [IX_Sales_SalesOrderDetail_SpecialOfferID]. This is because my query doesn’t care what my [SpecialOfferID] value is, just as long as it’s not equal to 1. My non-filtered NC index was created on [SpecialOfferID] because it needed to navigate the B-TREE to find the records where [SpecialOfferID] <> 1. With my filtered index, the query optimizer knows that all of my records already meet the criteria, so doesn’t need to navigate through the index to find the matching results. We could choose to include the [SpecialOfferID] data in our filtered index, but we’d most likely want to make it an included column rather than part of the index key. In fact, it’s important to note that, if I don’t add [SpecialOfferID] as an included column and I want to return it in the results, i.e. my filtered index will not be used and I will instead scan on the clustered index once more (assuming [IX_Sales_SalesOrderDetail_SpecialOfferID] does not exist). This is because the filtering criteria is not included anywhere on the actual index page. This is actually good news, in my opinion, since it allows you to create even leaner indexes. And like I already mentioned, if you do need the data returned, you can always add the filtering criteria as included columns. I personally recommend Kimberly Tripp’s system stored proc, sp_helpindex2. It returns a lot of good information about your indexes, such as included columns and filtering criteria. That’s all I have for today. Hopefully, you now understand how powerful filtered indexes can be. When used properly, filtered indexes can use less space, consume less IO, and improve overall query performance. Anyone who uses included columns is probably well aware of the frustrations that can come from having to look up information on which columns are included. I wrote a stored procedure, dba_indexLookup_sp, to help me with this, before discovering sp_helpindex2. If you haven’t heard of sp_helpindex2, it’s a re-write of sp_helpindex by Kimberly Tripp. You can find it on Kimberly’s blog. The main difference is Kimberly’s is a system stored procedure (mine is not) and my version returns partitioning information (Kimberly’s does not). Check both out and use whichever one meets your needs best. 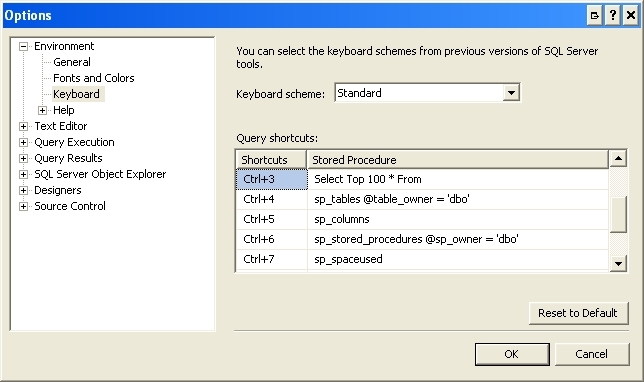 Please note that these settings will not take effect until you open a new query window. Here’s an example of how you could use this: use Ctrl+4 to find a list of tables, then copy one into your query window; to view a sample of that table’s data, highlight the table name (I usually double-click on it) and press Ctrl+3. It’s a thing of beauty. Oh, and you may want to remove/change the schema filters if you use schemas other than dbo. After having one too many issues arise from non-DBA’s connecting to the production environment to run a devastating ad hoc, I’ve had all of our developers and analysts adopt the following settings. The only thing difference between my setting and theirs is that I have “Set Statistics IO” selected. FYI – you can also make these same setting changes in Visual Studio. 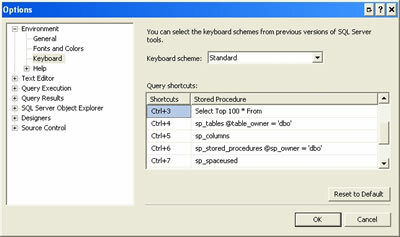 This next tip actually has nothing to do with SQL Server, and can be done with any Microsoft product. However, I just learned about it a few weeks ago and already I use it quite frequently. Holding down “Alt” while you drag your mouse will change your selection behavior to block selection. 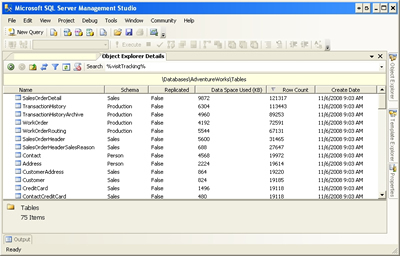 Please note: The following tools requires SQL 2008 Management Studio. 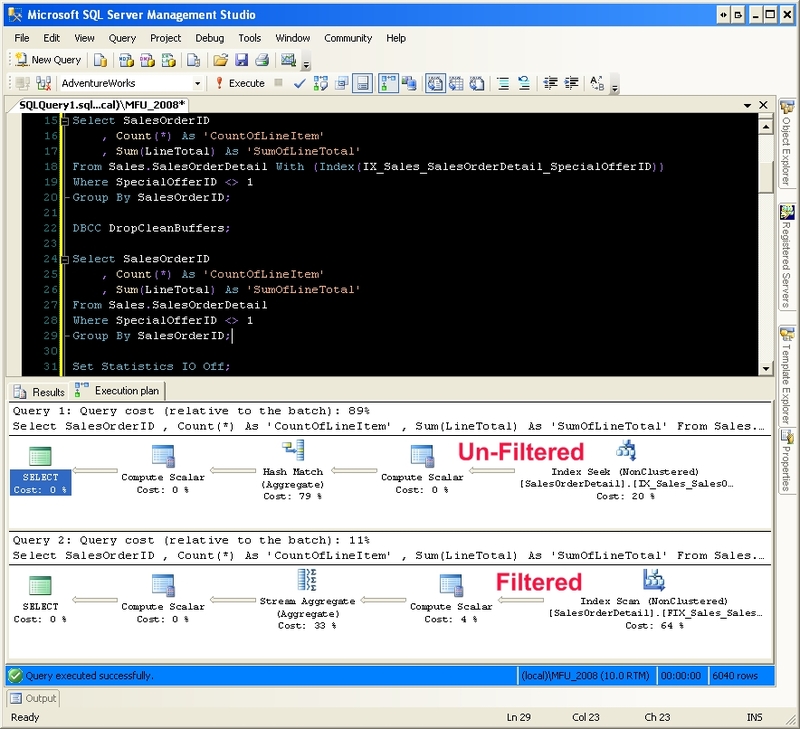 These tools will also work when you connect SQL 2008 SSMS to a 2005 instance. Finally, there’s a reason to use the Object Detail Explorer! My favorite use is to quickly find the table size and row counts of all the tables in a database. If these options are not currently available, you may just need to right click on the column headers and add it to the display. 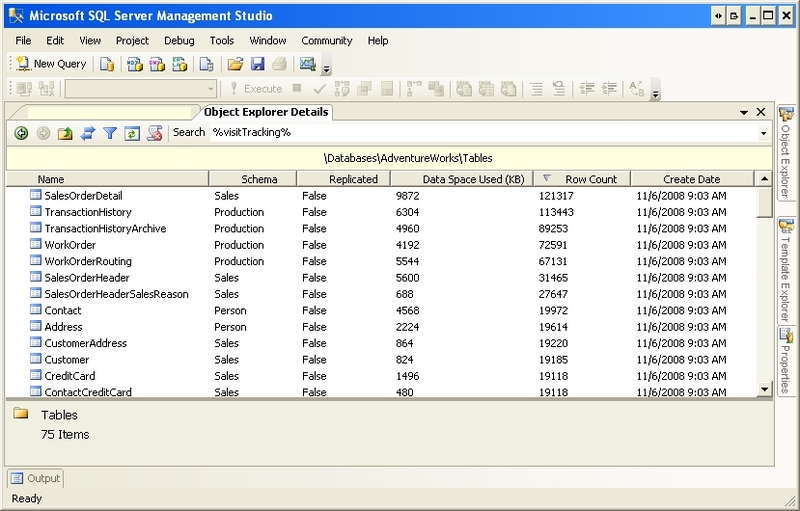 And lastly, when using SSMS 2008 to execute Display Estimated Query Plan (Ctrl+L), it will show you if you’re missing any indexes. 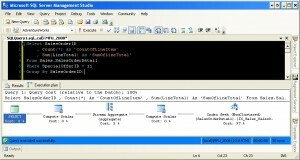 This will even work if you connect SSMS 2008 to SQL 2005! Thanks to everyone who left a comment or sent me an e-mail regarding the Index Defrag Script. I’ve received some great feedback and requests for features. I’ve also had some questions regarding how to use it, which I will answer at the end of this post. 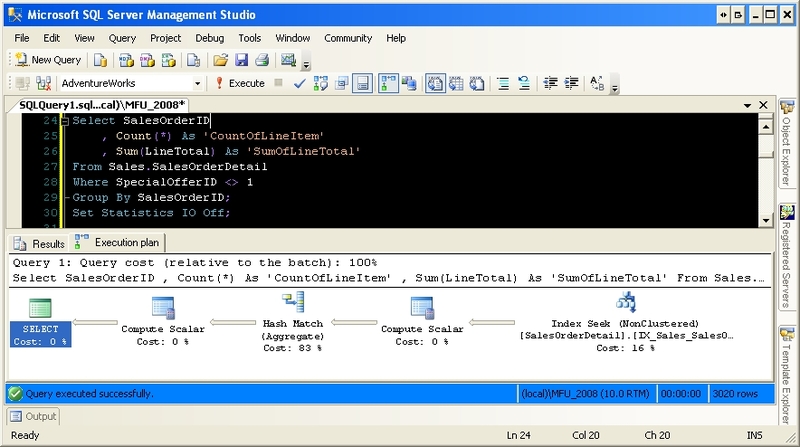 I’ve also verified that this script works well in SQL 2008. 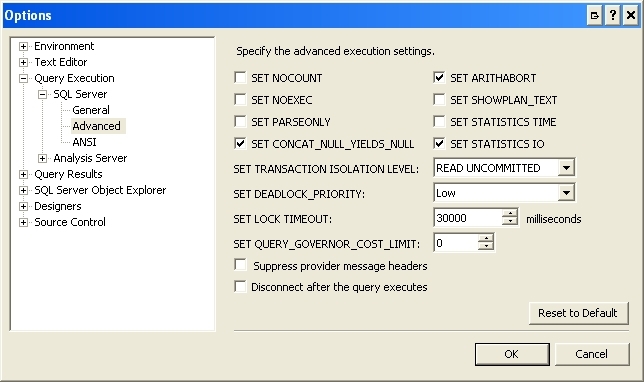 CAUTION: Monitor transaction log if executing for the first time! fragmentation if less than specified. … then execute the statements one at a time. 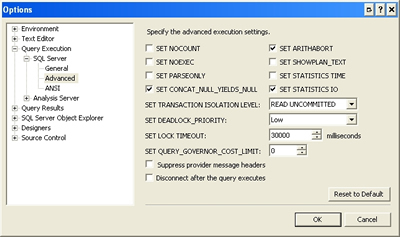 Make sure you monitor tempdb and the transaction log to ensure you don’t have any space issues. As promised, today I took a look at the performance of bulk inserts using XML and Table-Valued Parameters. I also compared it against singleton inserts to show the value in the bulk-insert approach. My tests were pretty simple: insert 100 records using each method. Each test was executed 10 times to ensure consistency. The duration was recorded in microseconds. The goal was to compare the performance of the inserts. 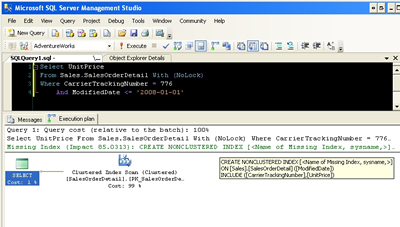 Because I was executing this entire test within SQL Server, I had to isolate only the actual insert transactions and ignore everything else, such as the loading of the data; that work would normally be performed by the calling application. As expected, both the XML and the TVP method performed significantly better than the single-insert method. As hoped, the table-valued parameter arguably performed the best of all 3.